The RPDX Speedshop showcases cool component add-ons as well as custom frame builds. Not every item is single-purpose. Some components in the Speedshop may also be featured on other pages of our website as well. If we’ve built it and it’s available for a test ride, we’ll state that specifically. Have something special in mind? Bring your component list to RecumbentPDX. Our mechanics can build any of our framesets to your dreams. If we build something special for a customer, we’ll post it here too! The 700 is already Catrike’s lightest. 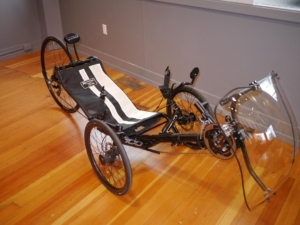 The body position provides the most aerodynamic and efficient power transfer of any stock recumbent. Red is SRAM’s top-of-the-line racing drivetrain – silky-smooth paddle-style shifting controls the super-light milled titanium and carbon-fiber 2×11 drivetrain powering a big Velocity Racing 700C wheel. The hollow pin SRAM 11 speed chain is the lightest stock chain available. Enduro ceramic bearings on all wheels provide the biggest “bang-for-the-buck” performance enhancement (and can be installed on any recumbent). FSA’s race-ready Afterburner hydraulic disc brakes haul the 120 PSI Schwalbe Durano racing slicks to a full stop smoother and faster than any brake we’ve ever tested. Can you ride this beast? Yes, you can! Call our shop to schedule a test drive. The Expedition is outfitted with a Rohloff 14 speed internal hub and Monster. The human-powered answer to Evel Knievel, hand-built in Serbia, Robert Stein’s aptly-named Wild One is the perfect vehicle if you want to go airborne (and land in one piece). Nearly 5-inches of ground clearance combine with independent suspension with almost 4-inches of compression each wheel! We’ve paired our stock SRAM 10 speed drive and FSA Gossamer triple –offering 560% gear range. But, if you plan to climb something a little steeper, adding a Wolf Components climbing cog to the cassette with an FSA 26 tooth chain ring ups it to a whopping 722% -with that range, you can climb a tree! Call the shop to schedule a ride. While riding a Catrike Folding Trail through the San Juan Islands last summer, we met a Trek Travel group sporting upright-equipped Di2 electronic shifting. Since standardizing on Di2, Trek Touring has logged thousands of trouble-free miles. RecumbentPDX took a Folding Trail and paired the paddle-selected electric-shift Di2 rear hub with a Patterson internal 2 speed front hub for a 500% range. By eliminating both the front and rear dérailleurs that confound some riders, we put the entire gear range at your fingertips. Like the Rohloff speed hub above, you can change gears from a standstill (very useful climbing hills!). 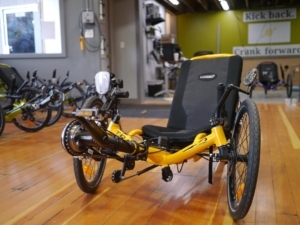 You’ll see this trike elsewhere on our website – the electronic shifting easily combines with single hand operation Tektro Twin hydraulic brakes allowing riders with limited or no use of one arm to safely and comfortably control steering and shifting one-handed. We love this trike. Call us to schedule a spin.